The main objective of this Atlas is to illustrate the beauty and diversity of the coccolithophores inhabiting NW Mediterranean waters. 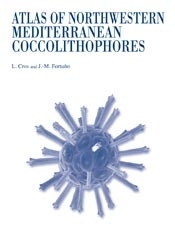 The book includes a brief overview of current knowledge on coccolithophore systematics and taxonomy and contains 103 figures with 411 SEM photomicrographs, corresponding to 168 coccolithophore forms (including different taxonomic and morphotypic entities) found in samples collected during several oceanographic cruises. Recently discovered coccospheres having coccoliths of different previously recognized species are presented. These combination coccospheres are nowadays considered as transitional steps between different phases in the cellular life-cycle of certain coccolithophores. The Atlas includes and illustrates a significant number of newly described species. Abridged descriptions of the studied taxa, together with measurements of the specimens and notes on their taxonomy are presented. An illustrated glossary of basic terminology and a taxonomic index are included to facilitate the use of the Atlas.